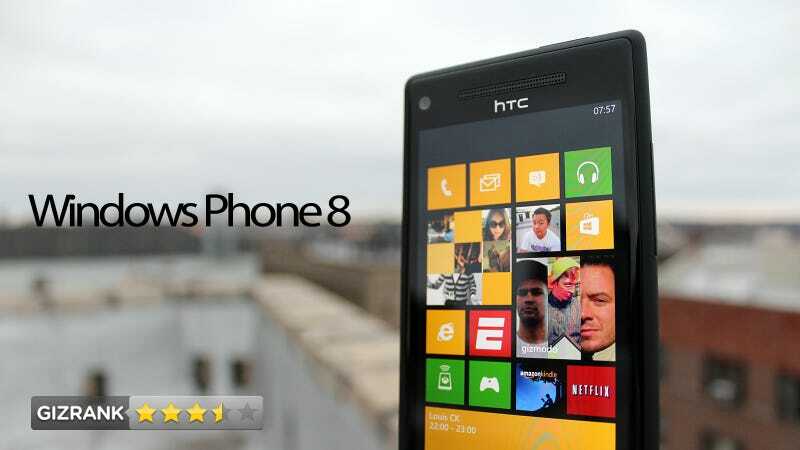 Windows Phone 8 is better. Better than the auspicious mobile reimagining Microsoft trotted out in 2010, and better than the bag of promises it delivered last year. Those felt like betas compared to Android and iOS, a half-baked platform long on promise. Has Windows Phone finally grown up? Well... sort of. Windows Phone has always been your best bet to break the two-party smartphone system, an almost-alternative to Android and iOS. It's been boldly imagined from the start, but has also felt incomplete. Random bits and blops haven't worked, absent features have grown more noticeable with time. Windows Phone 8 is the update that's supposed to fix all that, a fully realized vision that makes Windows Phone something you can safely recommend to your friends. It matters, too, for Microsoft. Under its roof, PCs, tablets, phones, and Xbox Voltron together seamlessly. Outside of its house, not so much. Mass adoption of Windows Phone is a crucial part of that ecosystem's success. To this point, it's not even close. Windows Phone 8 looks like, well, Windows Phone. There are Live Tiles here instead of the standard app icons you're used to on other platforms. The tiles can show dynamic information; things like weather, sports scores, or recent tweets will update in real-time. Think of Live Tiles as halfway between app icons and widgets. Microsoft used to call this interface Metro (it's just the modern UI now), and it originated on Windows Phone. So what looks new in Windows Phone 8? Customization. The start screen has been re-imagined, letting you make your Live Tiles smaller without losing their information-pushing abilities. It's a small change, but more control is almost always better. There are some other design flourishes, like the keys you press popping out in your accent color, not plain grey, but the only other major one is the stripe of wasted space along the right side of the home screen is gone now—your tiles go edge-to-edge. Microsoft and Google and Apple love to highlight all of the advanced new features they add to every operating system iteration. But when it comes down to it, what matters most are core, day-to-day uses, like how easy it is to find your notifications, read your favorite websites, and find directions. On that front, Windows Phone 8 is mostly unchanged. The biggest evolution in the Windows Phone experience is the start screen, which now has a smaller tile size, allowing you new heights of customization. Because the small tiles retain their Live Tile abilities (e.g. displaying how many emails, messages, or notifications you have without opening an app), you can shrink down boring functions (email, messages, and phone) to make way for more visually interesting tiles. The basic idea is the same—a Live Tile tells you about an update, you tap it to see your messages, etc. It sounds like a small change, but it actually dramatically boosts the amount of information that you can fit on the screen. Apps boot noticeably faster now, owing mainly to the relaxation of the hardware standards for the platform (our test device was dual-core, but WP8 supports up to 64 cores now). Aside from a few big exceptions like official Pocket, Instapaper, and Instagram apps, you don't really find yourself wishing for more apps, but you do sorta wish the ones Microsoft has worked better. The third party stuff is improved. Some, like ESPN, have all new builds and designs for WP8, while others, like Facebook and Twitter, are more modest—though still improved—updates. But none of them runs as smoothly as WP8's first-party apps. That needs to change. Overall, though, performance is fast, and touches like having all of your Facebook and Twitter notifications in one Me app, or having your entire communication history with individual friends accessible, aren't new to Windows Phone 8, but are still nice to have. The first thing anyone notices about Windows Phone, and especially Windows Phone 8, is the home screen. It's different. It's functional and modern and it moves. But it's also a fundamentally different way to organize your information from iOS or Android. The progression of the home screen is actually a pretty good bellwether for the state of apps in general on Windows Phone. In Windows 7 and 7.5, there were practically no good apps. Oh, there were a few decent finds in the Marketplace, and some of them would even load if you gave them enough time, but there weren't many that you'd actually want to use. That was partially the hardware's fault and partially the ecosystem's; the important thing is that it's largely fixed now, and as such the start screen has made room for more stuff on it. The result is awesome. But it also creates a predicament. WP8—like every Windows Phone before it—relies on one, continuous, alphabetized vertical scroll for app navigation. Just follow the arrow from your start screen to the right, and you'll see all your downloaded programs in a column that stretches from Angry Birds to YouTube. That's fine if your apps are limited, but as the WP ecosystem expands, it may have to evolve into something more like Windows 8's semantic zoom or—*shudder*—folders. We're not there yet, though. Live Tiles are also are intended to replace the idea of a notification center. But having one place where you can tinker with important settings and see your notifications is a hugely powerful and convenient tool—especially when it's available from anywhere on your phone, without leaving your app. Leaning on your start screen to do all that means you've got to quit out of apps way more often than you should have to. The performance. Windows Phone 7 and 7.5 were locked in to such rigid specs—single core processor, 512MB RAM, 800x480 display resolution—that it was hard to squeeze a modern functionality out of any apps or features. For example, the HTC 8X we've been using has a 341PPI display. The Lumia 920 has a 326PPI display. Both look pristine in a way that Windows Phone handsets haven't been allowed to until now For the first time, Windows Phone isn't fighting with one hand tied behind its back. Xbox Music is also really great. Here's a full rundown of Microsoft's new streaming service, but what's important here is that it's the real deal: Your streamed library and your local library are right there, in the same app. You can add more tracks from the Store—on your PC or your Phone—and in they go. No screwing with third party Rdio or Spotify apps. A lot of Windows Phone 8's other virtues are the same ones the platform has always enjoyed. But since no one uses Windows Phone, or, really, has even considered it, it's worth repeating the highlights. The platform is rock solid. It's really, really hard to get it to crash, or even stutter (I only saw one hiccup over several days of testing). Compare that to iOS 6 and Android, which both freeze up with some regularity. For what it's worth, WP 8 does get a lot of those little things right. The Lock Screen notifications, for instance, are very good. You'll get a Toast notification when something comes in, presenting a row of five possible icons. You can pick which service—phone, email, etc—goes where, and those updates will always be in the same place. Handy. The flip side, predictably, reads like a trimmed-down version of everything lacking before. That's expected. What should be much more concerning is that a lot of Windows Phone's the-future-is-here features that blew the doors off of iOS and Android when they were announced now just look like sorta-OK versions of themselves. Take Facebook chat and SMS integration. That was a wonderful addition when it was announced in Mango. Integrated communication hubs should be the goal for every mobile platform. But here, it's still imperfect. Incoming messages arrive just fine, but only messages sent from your handset show up on the phone—not ones sent from the web or a chat client. That was true in 7.5 as well, and is common to other chat clients, like OS X's Messages. But Android and iOS have extremely solid Facebook Messenger apps that perform this exact same function, without that hiccup. It's not a huge deal. It's not. But it's indicative of a lot of WP7's innovations being surpassed by the competition. Windows Phone staked its existence, in large part, on being not quite as mature as iOS or Android, but having this-is-what's-next features that made up for it. Now it's just got sorta dumpy versions of what everyone else has. Things probably won't get better any time soon, too. NFC payment—on Isis—won't be here until next year. And Microsoft said that it won't be adding Google Talk to its chat integration in the near future, and the same probably goes for Foursquare. That leaves Windows Phone on par, more or less, with everyone else. That's not the worst thing in the world. But when you're playing from this far behind, it may not be enough. Even the Settings menus is lacking. There is no easy way to turn off screen rotation, or adjust brightness, or do a bunch of other stuff that's relatively simple on other operating systems. Beyond that, simple functions in first-party apps tough or impossible to execute. You can't like individual comments in threads, or load entire tweet chains. It's the same Windows Phone story; there are a bunch of little quibbles that just keep adding up. A good bunch of the third party apps are still a nightmare, and will just dump you out of them without warning, or refuse to let you navigate up or down. Even apps from some high-profile companies, like GroupMe. Maps are accurate—they're powered by Nokia Maps instead of Bing now—and did not send me anywhere I didn't want to go. You can also download an offline version of any area of the world to use when you don't have a connection. That's very useful. But unless you get a Lumia, you're going to have to wait a while for Nokia's transit and turn-by-turn features to make it to all Windows Phones. They're exclusive to Nokia for a while longer, which is a downer for everyone else. Camera controls seem pretty good at first—resolution, white balance, exposure, contrast, saturation, sharpness, ISO. But our 8X didn't have great low light performance, and a processing-based night mode solution, like the iPhones, seems like it would go a long way. The clients used to sync Windows Phone 8 with your computer are better than they had been. In the past, it was just up to the Zune client, and a half-baked Mac client that melted everyone's computers. Now, it's a much more attractive Metro app on Windows 8 that makes adding media really simple (click Add photos, and then select which you want to add), with the ability to access the file directories to side load stuff. There's also a rebuilt version of the old WIndows 7 Mac client, which is serviceable, if not mind-blowing. Kid's Corner works more or less as Microsoft claims it should. You can pin stuff in a secondary start screen, so you can hand your phone to a kid without him getting at all your sexts. It's nice, and has all of its bases covered as far as what's not allowed in, and not letting the kids slip into your half of the phone. If this is a problem you face, you should use this. For an added bonus, subscribing to podcasts actually works now. For a long time, that was a joke feature. You'd press the button and nothing would happen. It's now as good as any other podcast solution out there. Local Scout is still dumb as a sack of hammers. Last year, it was sending us to stores and restaurants that were closed. Understandable for a new feature, but this year it's doing the same. It lists Bowery Mission, a homeless shelter, under Bars & Pubs and Breweries & Pubs. For local events near the Gizmodo office, it tried to send me to two separate New Year's Eve 2011 parties. Rooms—Microsoft's group-chat and planning feature—is another thing I'd love to tell you about. But I can't, because even though I sent out invitations to several of my friends, no one would join my Room. If they had, they would have been able to share the calendar events and notes, but couldn't have used group chat, since that goes through MSN chat protocols, and is exclusive to Windows Phone. On one hand, you can argue that it's just a better version of iMessage. And that's true to a point, but message systems are only as strong as the number of users they have. In all likelihood, Rooms will mostly serve to remind you how few of your family and friends actually use these things. When clicking through a link on Bing search, some full websites load, even though navigating to them manually loads the mobile site. Not ideal. NFC aside, the Wallet feature is a compelling way to store your payment data for any purchases you make using your phone. It syncs up credit cards, PayPal, and other payment types across your Microsoft account. However, we couldn't get the deals feature of it to load anything, despite repeated attempts. That might have been because we were using a European phone in the States, but we have nothing to report besides emptiness. We've seen integrated Skype calling and messaging in action (the Skype contact is built right into the People app), but we couldn't get a build to test ourselves. From what we saw, though, you can sync up you Skype account to let anyone call your phone over VoIP, and call quality was half decent. IE10 is actually pretty good in Windows 8. But the phone version—different than the RT and Windows 8 versions—is not nearly as full-featured as its big brothers. The dynamic lock screen is another of those nice little touches. It pulls a new photo from somewhere like Bing or Facebook every day (you can set where Facebook gets its photos), so your lock screen is always fresh. It's a small addition, but one that makes your phone feel a little fresher. Microsoft also announced a new feature called Data Sense that compresses web pages while on cellular networks, and shifts workloads to Wi-Fi when available. It's supposed to help people on limited data plans conserve bandwidth. We didn't get a chance to test it on our device, though. Well, maybe. Measured against its previous iterations, Windows Phone 8 is an unabashed success. But running a mile faster than you did last week doesn't make you an Olympian. Android Jelly Bean and iOS 6 have both improved since last year as well. It's a crowded field at the top, one that Microsoft still hasn't quite pushed its way into. If your phone is chiefly a communication device that you use for information and updates, and you want as little interference as possible, then yes, check out a Windows Phone. The hardware is good, and WP8 does the basics. For most people, that's honestly probably enough. But if you love all the niceties of a fully mature ecosystem—the Instagrams and Reeders and all the other startups that will not be building a WP app first, or any time soon—and a platform that's hammered out most of its kinks, Windows Phone probably still isn't there. Someday, maybe. But not this round.